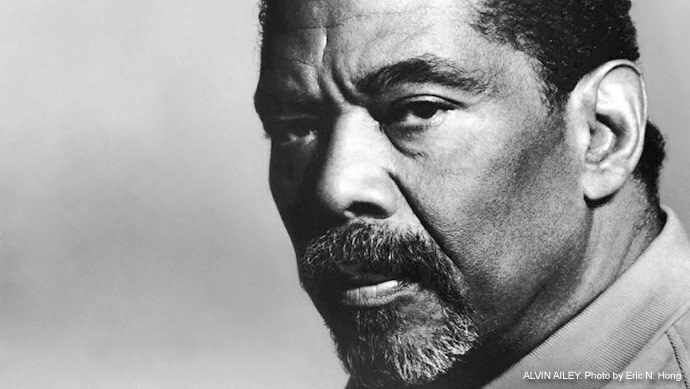 Born in Texas, Alvin Ailey was raised in Los Angeles, where his talents as a dancer were nurtured by Lester Horton. He moved to New York in 1954 and founded the Alvin Ailey American Dance Theater in 1958. It quickly became one of the most illustrious dance companies in the world. Especially known for the way he incorporated into his dance works black musical traditions, such as gospel, spirituals, and blues, Ailey premiered his most recognized piece, Revelations, in 1960. Ailey collaborated with such other well-regarded artists as Duke Ellington, Leontyne Price, Leonard Bernstein, Mikhail Baryshnikov, and Judith Jamison, who became his closest collaborator. Ailey’s company performed around the globe many times, including on several U.S. government-sponsored tours. For his work, he received the UN Peace Medal in 1982 and the Kennedy Center Honor for Lifetime Contribution to American Culture in 1988. Ailey died on December 1, 1989 of complications related to AIDS. The Alvin Ailey American Dance Theater continues to perform.